Laundry shops offer a convenient solution for busy people in Dubai who don’t have the energy and time to wash their dirty clothes. But lately, people who are sending their clothes to laundry shops for cleaning are finding in them unwanted and hazardous companions – bed bugs. Bed bugs are usually found making their nests in dark and tiny spaces in homes, offices, hotels, and just about any place that they can find a host to feed on. Unfortunately, their favorite hosts are humans, engorging their tiny body with human blood while leaving irritating and ugly marks on the hands, faces, legs, or any part that they chanced to feed on. More than just being annoying, these bites can result in more severe health problems like blisters and allergic reactions in some people, most especially in children. Control of bed bugs is a serious issue. Entry of bed bugs to your home by way of clothes that are fresh from laundry shops is the result of lack of effective bed bug control in these facilities. This usually happens when a lot of customers send their dirty clothes to laundry shops. The problem starts when one of these clothes belongs to a person with serious bed bug problem at home. Their clothes might carry bed bug eggs and even live nymphs in them, probably hidden in the pockets, in the seams, or in any part that is big enough for the bugs to hide, but are too small for the owner to see. Bed bugs eggs or nymphs can catch a ride to your home when your clothes come in direct contact with clothes that are infested with them. It just takes a single pregnant female to start a serious bed bug control problem in your home. Bed bugs are prolific breeders. A female lays from 1 to 5 eggs in one day and can live up to 300 days in ideal conditions. This means that a single female can produce up to 1500 eggs during its lifetime, which explains why these bugs are very hard to eradicate once they infest your home. Getting in direct contact with clothes carrying bed bugs eggs or nymphs is not the only source of problem in laundry shops. Bed bugs can make their home in the furniture and equipments in shops with poor bedbugs control. All clothing articles, mattresses, and accessories have the potential of picking up a few eggs or nymphs when they come in contact with these equipments. This chain of spreading bed bugs into clothing will continue for as long as the site and its equipment do not undergo bed bugs treatment and sanitation. Personnel from the laundry shop are not exempted from the problem. They are more often the first to bring these pests to their homes because of handling of bed bug infested clothes from their customers. In fact, they have higher chances of getting bed bugs if the equipment and the shop itself becomes the breeding ground of these parasitic insects. There is no easy way to prevent this problem from affecting you, but you can at least limit your exposure by checking out the hygiene of your favorite laundry shop. This is not even foolproof as you can’t tell just by looking at the operation whether the place needs bed bugs control issues or not. 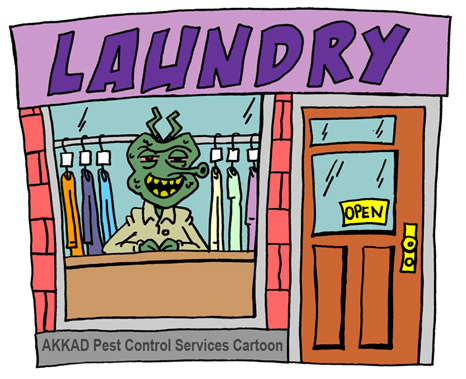 The best strategy is to stick with a shop that you know to be bed bugs free and hope that no customer brings bugs infested clothes while your own are in that shop. Prevention is always better than curing when it comes to the bed bugs treatment practices. However, these pests will always have the chance to infest your home for as long as you are sending your clothes to laundry shop. And when that happens, that’s when the real headache starts. Your home must be treated quickly on the first sign of bed bugs problem to avoid more costly treatments in the future. Akkad Pest Control is recognized as the best pest control provider in the UAE. Its Dubai office can provide you with quick response, often within less than 24 hours of your call, to assess the situation and provide you with the best possible solutions. Pest management companies like Akkad Pest Control are equipped with the technology and the expertise on how to control pest effectively and efficiently. Home remedies like the use of insecticides and pesticides can offer temporary relief from bed bugs, but the problem will just return without implementing a complete solution that kills every bug, egg, and nymph in your home. Remember, these bugs can so easily reproduce that missing a single nest and sparing a few pairs can immediately start the cycle of infestation. This is why commercial treatment offers the best solution to bed bug control issues in your home. Professional pest controllers from Akkad Pest Control know just about any place in your home where these pests congregate. They are also better trained and equipped to do the job effectively without resorting to harmful chemicals. With them, you are assured of a safe and bug free home in no time.